I'm looking for information and photographs of pilot Headle and his airplanes to include on this page. If you have some you'd like to share, please click this FORM to contact me. He served in WWI, learned to fly in Tours, France in 1917 and served as a flight instructor until 1919. His resume tersely cites “misc. flying” between 1920 and 1924 (although the Blue Book of Aviation, 1932 cites him as serving with the U.S. Embassy in Paris, France between 1919 and 1922), and “U.S. Marines” from 1924 to 1929. Regardless, beginning in 1929 he resigned from the Marines and flew for the Lockheed Aircraft Company as test pilot. 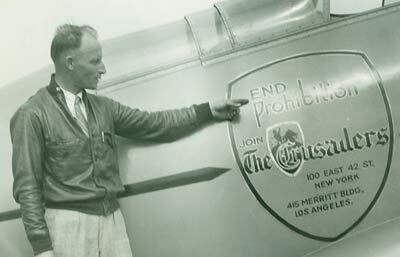 At left, Headle stands with the Lockheed Altair NR15W, which was purchased by The Crusaders, an anti-Prohibition organization that lobbied for the return of beer and light wines to the legal market. This may or may not be representative of Headle's position on prohibition. He was the acceptance test pilot at Lockheed that flew the airplane last before it was turned over to the Crusaders. In the photograph he carries a fountain pen in the breast pocket of his well-worn jacket. His hair trim shows signs of the use of typical hand clippers of the era (below). Marshall Headle landed once at Parks Airport, on Thursday, April 23, 1931. Not surprisingly, he flew a Lockheed Vega 5C Special, NX965Y. Based at Burbank, CA, he cited his destination as Burbank, too. He gave no reason for his visit at St. Louis, nor did he note carriage of passengers. The airplane was later owned by Amelia Earhart and was destroyed by fire at Memphis, TN, August 26, 1943. His Lockheed landed at St. Louis a couple of months later on June 22, 1931 flown by a pilot identified only as "Marshall." Pilot Marshall was eastbound from San Francisco, CA to New York. It's tempting to think it was Headle flying again, signing in with only his first name, but it is difficult to make the handwriting match. At Lockheed, Headle became Chief Pilot in Charge of Flight Operations in 1930 and served in that capacity throughout the decade. Over the years he worked for Lockheed, his role evolved from test pilot, “old style” to a sort of international business diplomat: Chief Test Pilot, “new style.” From 1935 on, he traveled internationally and demonstrated new aircraft and oriented new owners to their chosen Lockheed product. In addition to his signature in the Parks Airport Register, he also signed the Davis-Monthan Airfield Register three times. Marshall Headle's full biography is online at the Davis-Monthan Airfield Register Web site at the link. More photographs, links and downloads are at the link that further define this accomplished pilot. He carried Transport pilot certificate T7274 and was a member of the National Aeronautic Association, Professional Pilot’s Association and the American Legion. Marshall Headle was born March 21, 1893 at Winthrop, MA. He died May 4, 1945 of a heart attack at Burbank, CA.